Lon g before any Dickinsonians are awake, our staff of four bakers are on campus daily ready to prepare a day’s worth of delicious treats. This morning, however, they were tasked with creating fastnachts. Fastnachts are a traditional Fat Tuesday donut made throughout South Central Pennsylvania. Fastnachts are synonymous with Pennsylvania Dutch culture. These donuts are made annually on the day before the Lenten season begins, customarily using up ingredients given up for the upcoming season. 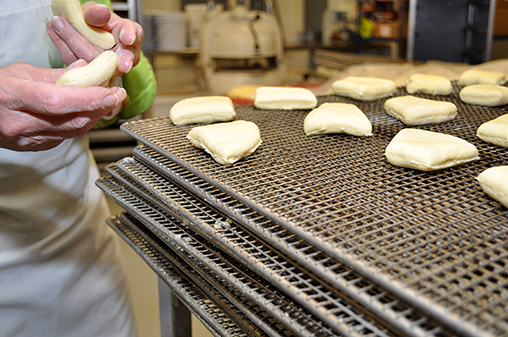 Every bakery has its own twist on the recipe, but potatoes are a common ingredient that sets these donuts apart. Pulling out the Dickinson recipe is a walk down memory lane for Dining Services Head Baker Kay Yeruski. Accompanying the recipe is a cluster of Yeruski’s annual notes dating back to 2001. Each year’s note states how many donuts the recipe yielded as well as instructions on any alterations that were made to the preparation process. In 2011, the recipe yielded an all-time high of 46 dozen donuts. Making enough fastnachts for hungry Dickinsonians is a roughly 2-3 hour process that includes mixing, rolling, cutting, proofing and frying the donuts. 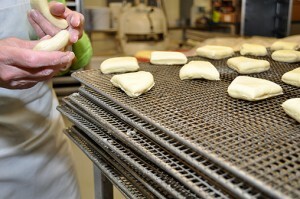 While there is a considerable time investment, today is one of our bakers favorite days on the calendar. Where are they going to be available on campus? Are they only in the dining hall? Thanks! Yes, the Dining Hall is our only location serving Fastnachts this morning. Thanks for your interest!